Our last episode ended on a huge cliffhanger as someone got stabbed, but we didn't know who. Episode 6 resumes where we left off. Ji Hong has burst into the room and Hye Jung is laying in a pile with the mob boss and Mr. Creepy, one of them having just been stabbed. Ji Hong pauses briefly while Yoon Do jumps right into action assisting Hye Jung in getting Mr. Creepy off and it quickly become clear that Mr. Creepy was the one who got stabbed. Yoon Do wants to make sure Hye Jung is okay, but she insists that she is and goes right to work helping Mr. Creepy. Ji Hong freaks out at Yoon Do, wondering what he was doing in the situation to let it get this far. 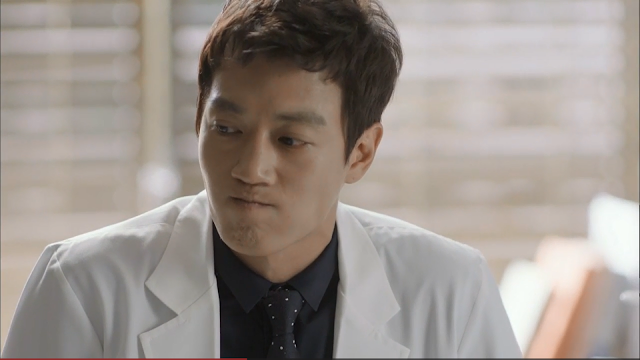 Hye Jung tells him to calm down and to call general surgery as Mr. Creepy is now suffering from a stab wound. The mob boss needs attending to as well. Once the chaos clears and the patients are taken care of, Hye Jung talks to Ji Hong. She explained that Yoon Do was actually helping and the fact that he tripped Mr. Creepy is the reason that she and the Mob boss didn't get stabbed. Ji Hong tells her he's going to do something to her as a person to another person and then he hugs her. After they part she sees Yoon Do and tries to talk to him, but he comically covers his face and runs away. She catches up to him and he admits that he's embarrassed for not doing more as a man. He thinks that he should have been the one to kick the knife out of Mr. Creepy's hand. Hye Jung doesn't feel the same and she is genuinely grateful to him for his help and thanks him. He's unsure of how to accept her gratitude when he's still embarrassed. She shows off some of her martial arts skills to show him that she's a pro even though she's a woman. I think she does this to show he has no reason to be embarrassed. She's been trained and has the skills and he doesn't. When she leaves Yoon Do is flustered, even going so far as to put his hand on his heart. Man, he's falling for Hye Jung quickly! He's going to have it bad. That night, Yoon Do's uncle spends the night at Ji Hong's house and when they come out together in the morning they run into Yoon Do who finds out that they're friends and then they all ride to work together in Yoon do's car despite Yoon Do's protests. I wonder if either Ji Hong or Yoon Do realize that they're rivals in more than just work. The next day Hye Jung waits for Ji Hong at his office with a flower as a welcoming gift and hands him a slip of paper with her grandma's case number. She asks him to look up the file for her since she doesn't have access. He takes the piece of paper and rips it up, completely shocking her since she thought he was on her side. He explains that he doesn't want to her doing this, that as a doctor she should understand that things can go wrong during surgery that are outside of their control. She's doing so well, that he doesn't want to see her go down this path. Hye Jung is not touched by this at all. She feels betrayed and is especially upset that he ripped up the piece of paper. She explains that becoming a doctor makes her even more enraged at the way that her grandma's surgeon (Seo Woo's dad) acted so nonchalantly. Hye Jung tells Ji Hong that she'll just find someone else to help her. He asks what she'll do when she finds out what really happened. She says she'll figure that out when it happens. She leaves and Ji Hong actually tapes the paper back together and tries to look up the file when she leaves but he doesn't have access either. Elsewhere in the hospital, Seo Woo tells Yoon Do that Hye Jung is the one responsible for her trauma, but he sees right through her. He tells her that he doesn't think she was the victim back then. He also warns her not to get too close to the lady from the restaurant who collapsed as she's been spending all her extra time with her. Soon Hee comes to visit the hospital to promote her café and as she's entering bumps into a grumpy woman with a facial tic, the woman being Hye Jung's evil step-mom. Uh-oh, I was hoping she wouldn't show up again. Anyway Soon Hee greets the different doctors to promote her cafe. Hye Jung has a consultation with a new patient who turns out to be her step-mom accompanied by her half-sister. While the mom is surprised to see Hye Jung, Hye Jung acts as if she doesn't know her. They stumble out of her office in shock after Hye Jung dismisses them, but then the step-mom gets angry and goes back to call Hye Jung out for treating her family poorly. Hye Jung responds to this by stating that she isn't family. It doesn't take long for rumors of this situation to circulate around the hospital. Hye Jung knows that her step-mom is going to need surgery, but she doesn't want to be the one to do it. 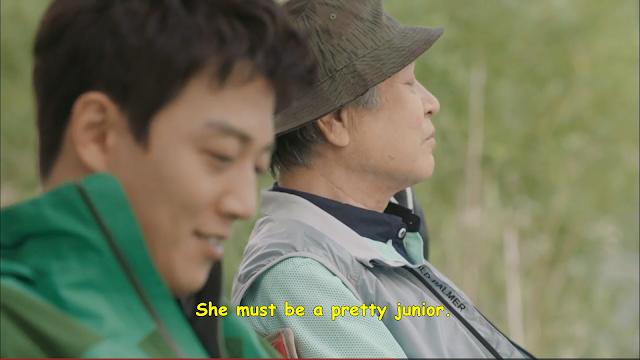 She calls Ji Hong, who is off fishing with his dad. She's going to ask him, but when she hears he's out of the office she says nevermind and lets him go back to fishing. 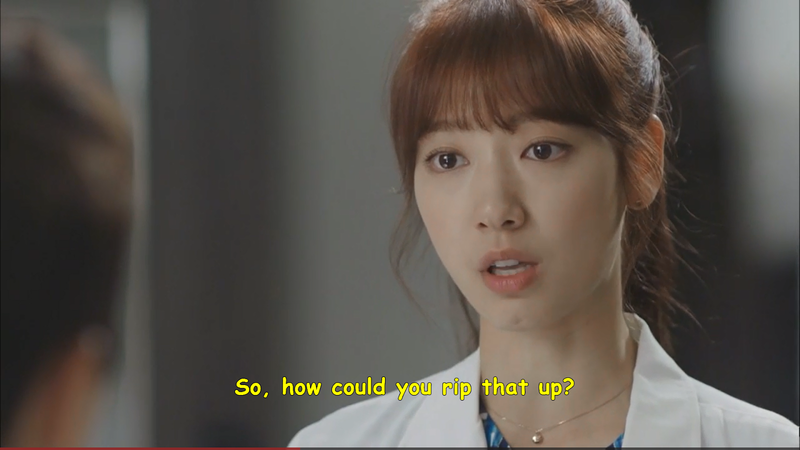 Instead, she asks Yoon Do to take a look at the patient file. She asks if he'd do the surgery instead of her. Not knowing the situation, he tells her that it's against the hospital policy to swap patients, although he's quite kind about it and she realizes he's a by-the-book type of doctor. Yoon Do asks if the patient is family and Hye Jung says no. Seo Woo again tells Yoon Do he should stay away from her. Hye Jung and Soon Hee have lunch together in the cafeteria and Hye Jung tells her about her step-mom and sister coming to the hospital. Soon Hee of course sympathizes with with her. Seo Woo sees the two together and seems upset that they're still friends and they chose each other over her. Meanwhile, while Ji Hong is with his dad, he hands him the slip of paper with Hye Jung's grandma's name and asks him to get the file for him since he doesn't have access. Back at the hospital Hye Jung is meeting with her step-mother and half-sister again. Hye Jung tells her step-mom what kind of surgery she'll need to have, reassured her there's a high success rate, and then asks her to go to another hospital. Her step-mom refuses when she found out that she could get a discount as her family member. She tells her that Hye Jung never did anything for their family so that she could do this and told her that only on the outside did she get smart. After they leave, her half-sister comes up to Hye Jung and gives her a business card to their restaurant. She tells her that they make a decent living and won't be a burden to her, implying that she should come around. Once Yoon Do has realized that the patient Hye Jung wanted help with was her step-mother, he decides that he's going to do the surgery on her behalf. She accusing him of changing his opinion on her and he admits that he did, but that there's nothing wrong with changing your mind. Shortly after that, the restaurant ahjumma Seo Woo grew close to dies and Seo Woo straight out loses it screaming and sobbing the whole time. Hye Jung finds the restaurant that her family owns and looks on from across the street, but she doesn't enter. She sees her dad acting sociable and talking with customers and leaves. After Hye Jung leaves the restaurant without ever entering it, she comes across Ji Hong. He gives her a folder containing her grandmother's file, telling her he had to call in a favor to get it. Ji Hong tells her that if the truth makes her happy, then he's going to help her find it. It begins to downpour suddenly and the two take refuge in a telephone booth and have flashbacks to 13 years prior when they stood under the awning together while it rained. Ji Hong recites a quote about choosing to dance in the rain rather than waiting for the storm to pass so he brings up music on his phone and begins to dance in the rain. Hye Jung laughs, but then he brings her out in the rain two and they dance together. They laugh and dance but eventually things get serious between them as they exchange the looks that people sometimes do. Ji Hong tells her he's going to do something to her as a man to a woman and then he kisses her. And that my dear friends is Episode 6's cliffhanger. They've really been doing a good job with those cliffhangers, haven't they? Pure torture. -It was really a jerk move for Ji Hong to rip up the piece of paper. Like even if he didn't want to help, he didn't have to go that far. That was actually really disrespectful and I was disappointed in him. I'm glad he came around and decided to help her regardless of the consequences, but still...come on, bro. -Hye Jung's step-mom needs to go back through the pit to hell from where she came. Maybe she's become a better person. But she was just so awful in the beginning of the drama that I don't think I'll ever forgive her. Hye Jung's sister seems pretty sweet, though. I would like to see her and Hye Jung form a close relationship, although that means inevitably having to deal with the rest of her "family". -I was kind of hoping the tension/disagreement between Ji Hong and Hye Jung would last longer. Things seem to be going too go between them and that's never a good sign in a Kdrama. Plus if she was mad at him for awhile, it would be a good opportunity for her to grow closer to Yoon Do which would things more exciting. -Speaking of Hye Jung and Yoon Do. I really like they're developing friendship. They're a good match for each other I think. his personality is pretty quirky and different than he seems at first. I like how he's willing to change his mind and admit when he's wrong. It's an admirable quality in my opinion and that factor about him seems to bring out Hye Jung's soft and fun side. -I don't want to be too critical of the kiss scene, because after thinking about it- what does it matter if Shin Hye's kiss scenes don't make the "best kiss" lists? She's a great actor and we love to watch her. But I do have to say that her kiss scenes haven't changed much since You're Beautiful. The Shin Hye kiss stereotype of "I'm not really sure I want to be kissing you" look is alive and well. But maybe she's just playing it like Hye Jung is conflicted about if it's appropriate to be romantic with her old teacher. Only time and future kiss scenes will tell. -Yoon Do is pretty intuitive. Honestly, I was not feeling his character at first but he quickly has become a favorite of mine. 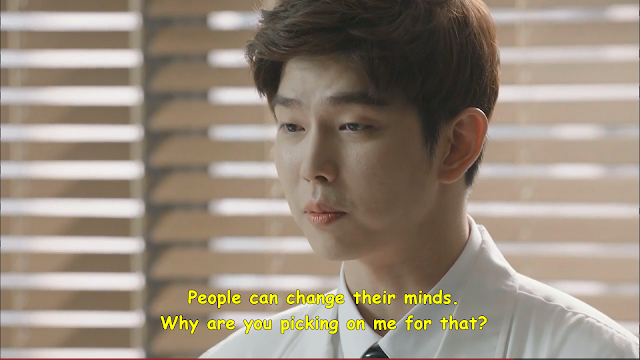 He realized without have to be told that Seo Woo had antagonized Hye Jung. He sees Hye Jung's good qualities easily and while he was a bit prideful, it takes a really strong character to be able to admit when you're wrong. I love the relationship he has with his uncle too. It's playful and adorable. -No Jisoo this episode? Jisoo, come back to us! We need you!!! So now you have my thoughts. What were yours? If you haven't caught up on the show yet, you can check out all my recaps here on my Doctor Crush main page. Until next time, don't be a stranger, be a friend. Usually, I respond to thoughts/comments in order, but I'm going to begin with: this episode was definitely the most disappointing I've watched this far. I really hope this is not a sign of things going downhill. The kiss especially was terrible. Like terrible. I'm hoping to some god that we at least get a Pinocchio level (honestly, preferably above that) kiss from Shin Hye during this drama. I'll try to be less critical, haha. Now that I've complained about that, I'll bag on Ji Hong. He hasn't really impressed me. I don't hate him or anything, and I get that he's infatuated, but I just feel so done with him (possibly because that kiss was so awkward and terrible looking). I think he will redeem himself with the hospital drama arc though --- assuming his dad helps them out and then it becomes an all-out war with Seo Woo's dad's camp. I did however enjoy the tension between Ji Hong and Yoon Do though. I don't know how much of an age difference they're supposed to have, but Ji Hong feels like he would be a good "older brother" influence on Yoon Do, and the car scene was pretty cute. Yoon Do is just a character with so much potential that it makes me feel like they're rushing the main romance (though yeah, technically the falling occurred years ago). 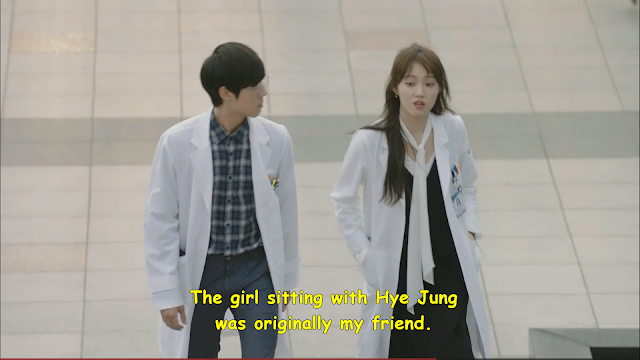 I agree with your assessment that he brings out a different side of Hye Jung. It's probably just my bias, but I prefer my age gap couples with that sort of dynamic: the older one is still sort of mature, but learns a lot from their younger partner, and the younger one is both mature and self-confident. With Ji Hong, the only thing that saves the inequality inevitably brought out by the age gap is that he's pretty nice. (Obviously, the ripping the paper thing was not nice, which is why I'm currently not happy with him). Otherwise, there's nothing particularly "wrong" about the couple... they're just... eh. I could live without them. As an aside, Yoon Do is adorable. The thing that surprised me the most about this episode is how upset Seo Woo seemed about Soon Hee leaving her side. From the get go, I never got them impression (and Soon Hee too, we later find out), that she cared too much about her. She blew her off without caring, and expected a lot of her without returning the favor. The entire thing made her seem not just petty, but delusional. Because of that, I couldn't even bring myself to feel bad for her when she breaks down because of that woman. She's just so full of envy and hate for no good reason whatsoever (I mean, this girl has hardly experienced real hardship), and while I think she has good qualities buried somewhere in there, they're just buried so deep, I don't understand how someone could like her. Unless they were dark and twisted. Yeah, I'll admit I was a little disappointed in the kiss at first, but I've come to terms with it now that I realized Hye Jung has had no experience with boys and was trying to get herself to run away when he kissed her. Still, it was one of the more uncomfortable Shin Hye kisses to watch. I think Rae Won overall is kind of an awkward kisser as well. I feel apathetic toward Ji Hong too. I don't really hate him, but he seems very flat and one-dimensional. I am learning more and more toward Yoon Do because you're right, he is adorable. I haven't found any likeable qualities in Seo Woo yet either. She used Soon Hee when it was convenient and now acts like Hye Jung stole her soulmate from her by becoming Soon Hee's friend. While he hasn't done anything outright horrible since the lie when they were teenagers, her horrible personality makes her seem all the bit the villain.